If you use an arm that reaches from the wheel axle to the handle, the distance is approximately 0.8382m from the ground less the 0.0762m wheel radius, or 0.762m, so about 38N-m. If you instead use a shorter arm, less torque will be required of the motor, but you won't be able to tilt the can as far. While tilting the can, you need to counteract the force required to tilt it. 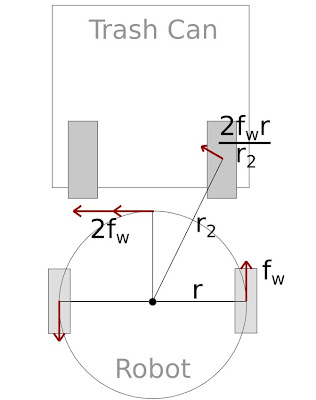 If the chassis has trailing wheels as pictured above, they will tilt up if the force f2 exceeds the gravitational force at the trailing wheels. So to keep the robot from tilting, put a mass over the trailing wheels at least f2/9.81. There's leverage at play here. 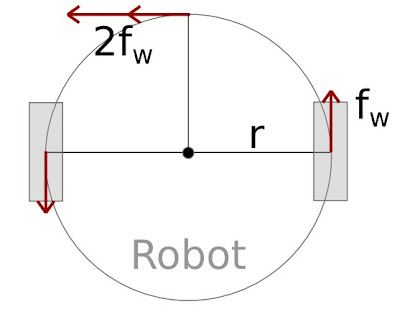 If the length of the robot equals the height to the pivot point of the arm, then f2 = f. If the length is shorter as pictured, then f2 > f, by a factor equal to the ratio of these two distances, otherwise f2 < f, by the same factor. A longer arm means less leverage on the trailing wheels by the arm pivot point. But the motor torque on the arm will have to increase to apply the same force. A bigger motor or lower gearing, meaning lower speed, will be required. Another option, the robot could drive the motors backwards toward the can while tilting to counteract the force with the main drive motors' torque. Still another option, put the upright and arm more toward the robot's middle, reducing leverage of the pivot point. I'm sure you figured out five minutes ago that the simple solution is to put the trailing wheels on the other side, but then one side of your chassis will have to be open which means the chassis will be less rigid unless you add additional reinforcement. Seems like a reasonable solution. One more thing to think about when wheeling instead of lifting. 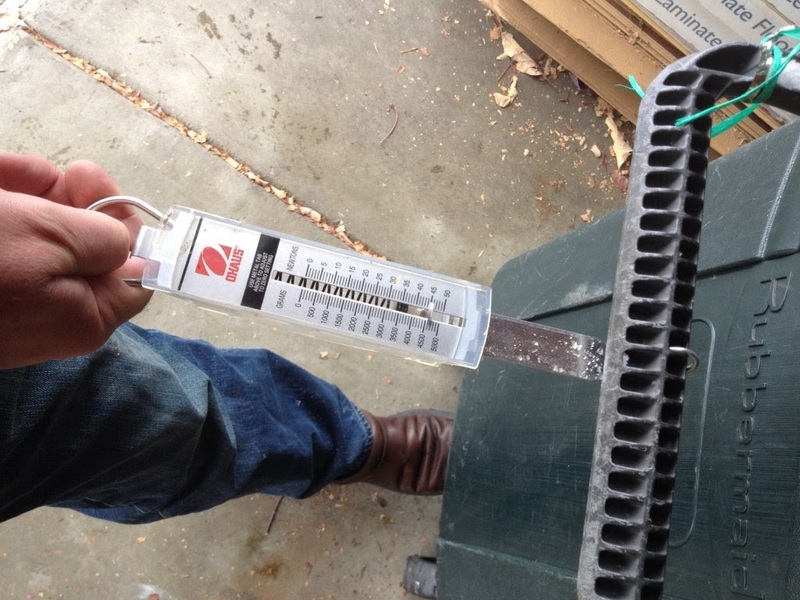 How do you turn the robot when you're clamped onto a trash can? Let's assume the robot will have differential drive because that will provide the best maneuverability in tight quarters the robot is likely to see. To turn the robot, one wheel goes forward, the other in reverse. Each exert an equal force, fw. The total turning force at the robot's track width is 2fw. The torque exerted by both wheels is 2fwr. Now if you have a trash can with its own wheels sitting on the ground and those wheels aren't coaxial with those of the robot, you have some problems. Here's why (even though you probably know this intuitively). The drive wheels will exert a force at the trash can wheel. That force will be perpendicular to a line drawn from the can's wheel to the robot's center. How much is the force? Imagine a there's a virtual arm with a force at a distance r2 shown below. To find the force, take the torque and divide by the arm's distance. So, for one thing, the force is smaller than it is at the drive wheels. More importantly, the force is trying to move the trash can's wheels mostly sideways. Yeah. Good luck with that. So either we put our drive wheels next to the can's or we have to have a pivot point where the robot grabs the can. With a pivot point we're now able to exert a torque on the trash can. The force at the pivot is still 2fw. 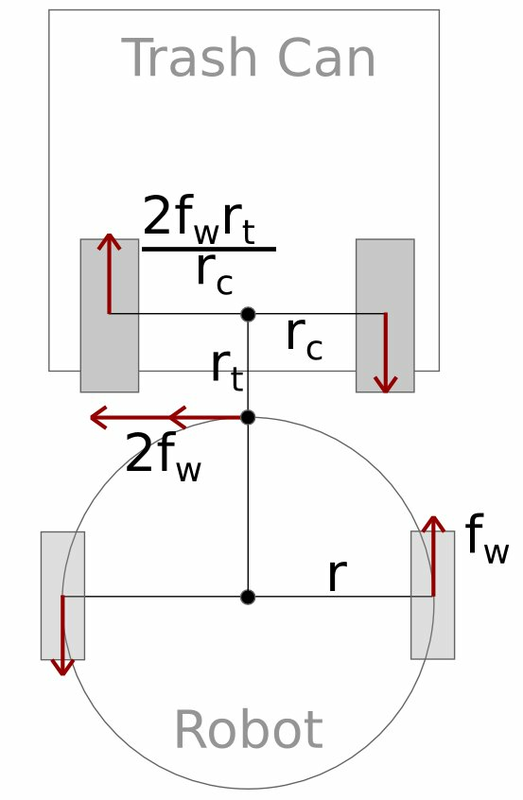 The torque exerted on the can is proportional to the radius of this pseudo-trailer's tonque, 2fwrt. 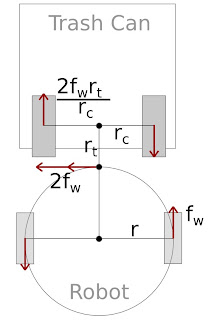 The force exerted at the can's wheels is the torque divided by the wheel radius of the can, rc. If we have a trailer, and we have trailing wheels behind the robot to deal with the lifting torque of tilting the can, that means we have to make the chassis wide enough to let the trash can turn. Something else to think about. drag the can with wheels coaxially located. There's a lot more design to work out just on the physical side let alone software and electronics. We'll get to all that. But for now, I'd like to start prototyping the chassis. I like to build the electronics once I have some idea of what the chassis is going to look like. Gary, that's a fantastic idea. Thanks! What if the counterweight is used to tilt the can but also the counterweight sits out over the front wheels to help balance the robot? I'll have to think more about this. Your trash can already has 2 wheels. You just need to add a third, steerable wheel to turn the can itself into a robot. That's the simplest idea I can think of. Turning the trash can into a robot would definitely simplify the design considerably. The reason I didn't want to go that route is that I have multiple trash cans and the trash guys pick up the cans themselves. 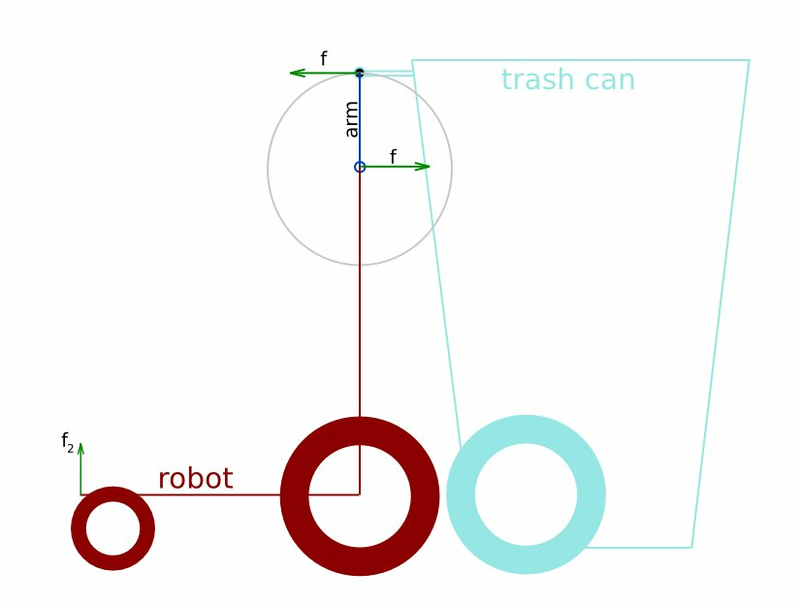 As a proof-of-concept I could do the trash-can-as-robot, though. Thanks! Are you still planning on building your robot? My 10-year old son and I are following your blog. We are interested in learning how to do this! Most definitely! Really cool to hear that you and your son are following along! I'm happy to help you out anytime. I've been working on chassis design, thinking about different options, while working on various other things, too. I'll be posting an update soon.